Holland America Line’s Nieuw Statendam has launched its inaugural season from Port Everglades, Fla. The second in the line’s Pinnacle Class builds upon its popular predecessor, MS Koningsdam. But, she also unique in a number of ways. “Nieuw Statendam represents our continued evolution of adding exciting new experiences while maintaining the hallmarks that have made Holland America Line a leader in premium cruising,” said the line’s president Orlando Ashford at the shipyard handover ceremony. The 2,666-passenger ship features creative spaces by famed hospitality designer Adam D. Tihany and designer- architect Bjørn Storbraaten. She holds eight more staterooms than Koningsdam. And, she builds upon popular concepts such as the “Music Walk” venue. On Nieuw Statendam, passengers can enjoy a musical cornucopia ranging from Lincoln Center Stage to Billboard Onboard and B.B. King’s Blues Club. New to Nieuw Statendam is the Rolling Stone Rock Room, produced in partnership with Rolling Stone. The venue features a five-piece band that Ashford says will provide a must-see show. In place of the Culinary Arts Center, Nieuw Statendam introduces the new Club Orange. The specialty restaurant is complimentary for suite-class passengers. It’s available for a fee to other passengers. The dining room roll-out is part of the line’s new Club Orange program of exclusive amenities. Priority boarding and tendering, a dedicated concierge and enhanced stateroom dining options are part of the mix. Club Orange is available for purchase by a limited number of non-suite passengers each sailing. New dining venues aboard Nieuw Statendam also include Nami Sushi. Located adjacent to Tamarind, it will feature rolls designed by sushi chef Andy Matsuda, who is on the line’s culinary council. Other new and noteworthy spaces aboard Nieuw Statendam include an expanded and interactive Explorations Central & Café on Deck 12. It takes over the space occupied by Crow’s Nest. Nieuw Statendam will spend a full season in the Caribbean sailing roundtrip from Fort Lauderdale. Cruises include a day at Half Moon Cay, Holland America Line’s private island. The ship’s official naming ceremony takes place in Fort Lauderdale on February 2. Oprah Winfrey will serve as Godmother. Winfrey also hosts a sold-out three-day “Girl’s Getaway” cruise that departs on January 30, 2019, from Fort Lauderdale. 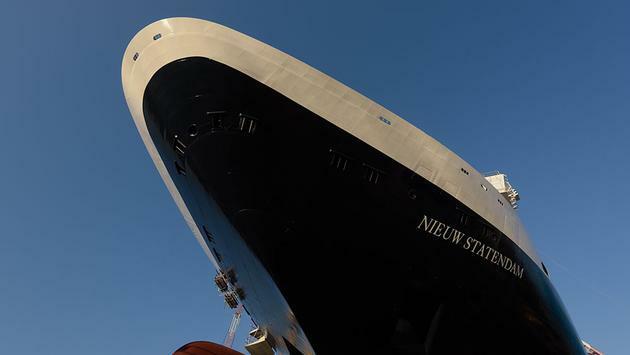 In April 2019 Nieuw Statendam repositions to repositions to Europe. She’ll homeport in Amsterdam, and sail northern Europe, Baltic and Iceland itineraries. In September, the ship heads to the Mediterranean for cruises out of Civitavecchia. Nieuw Statendam will return to the Caribbean in October 2019.